Ahumanitarian works for the well-being of others. 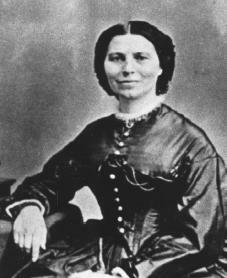 The American humanitarian Clara Barton was the founder of the American Red Cross. Her work helping people in times of war and times of peace made her a symbol of humanitarianism. Clara Barton was born on December 25, 1821, in North Oxford, Massachusetts. She was the youngest child of Stephen Barton, a farmer and state law maker who had served in the American Revolution (1775–83), and his wife, Sarah. She later recalled that his tales made war familiar to her at an early age. Barton acquired skills that would serve her well when, at age eleven, she helped look after a sick older brother. In return her brother taught her skills that young women did not usually learn, such as carpentry. later took pride in having established the first free school in New Jersey and in having raised enrollment from six to six hundred. However, when town officials decided to appoint a male principal over her, she resigned. Barton was working for the patent office in Washington, D.C., when the Civil War (1861–65) began. She decided to serve the Federal troops by personally collecting and storing supplies that people had given freely in support of the troops. In Washington she collected and stored food and medical supplies that could be distributed to the troops. In 1862 she was permitted to travel to places where the fighting was taking place. Barton was with Federal forces during the siege of Charleston, South Carolina, and also at battles in other areas. Barton did not work primarily as a nurse during the war. She became increasingly skilled at obtaining and passing out supplies. However, her courage and concern for people made her presence strongly felt everywhere she went. In 1865 Barton decided to begin the project of locating missing soldiers. With President Lincoln's approval, she set up the Bureau of Records in Washington and traced perhaps twenty thousand men. Barton suffered from periods of poor health. In 1869 she went to Geneva, Switzerland, hoping to improve her condition through rest and change. There she met officials of the recently organized International Red Cross, a group that worked to help victims of war. They urged her to seek U.S. agreement to the Geneva Convention, a treaty that permitted medical personnel to be treated as neutral parties who could aid the sick and wounded during wars. Before Barton could turn to this task the Franco-Prussian War (1870–71), a war in which France was defeated by a group of German states led by Prussia, began. Barton helped organize military hospitals during this war. Her most original idea was to put needy women in Strasbourg, France, to work sewing garments for pay. She also introduced this work system in Lyons, France. In 1873 she was awarded the Iron Cross of Merit by the German emperor, William I (1797–1888). It was one of many such honors for Barton. Barton then returned to the United States and settled in Danville, New York. In 1877 she wrote to a founder of the International Red Cross and offered to lead an American branch of the organization. Thus, at age fifty-six she began a new career. In 1881 Barton incorporated the American Red Cross; that is, she organized it as a legal corporation. The American Red Cross was devoted to helping people in need during peacetime as well as wartime. She herself served as its president. A year later her extraordinary efforts brought about U.S. agreement to the Geneva Convention. In 1883 Barton also served as superintendent of the Women's Reformatory Prison in Sherborn, Massachusetts. However, she remained devoted to her major cause. In 1882 she traveled as a Red Cross worker to assist victims of fires in Michigan and earthquake victims in Charleston, South Carolina. In 1884 she brought supplies to flood victims along the Ohio River. Five years later she went to Johnstown, Pennsylvania, after it suffered a disastrous flood. Barton also traveled to Russia and Turkey to assist those in need. As late as 1900 she visited Galveston, Texas, to supervise assistance after a tidal wave. In 1900 Congress reincorporated the Red Cross and demanded a review of its funds. Soon public pressures and conflict within the Red Cross itself became too much for Barton. She resigned from the organization in 1904. By this point Barton was a figure of international fame. She retired to Glen Echo, Maryland, and died there on April 12, 1912. Burton, David H. Clara Barton: In the Service of Humanity. Westwood, CT: Greenwood Press, 1995. Dubowski, Cathy East. Clara Barton: Healing the Wounds. Englewood Cliffs, NJ: Silver Burdett Press, 1991. Oates, Stephen B. A Woman of Valor: Clara Barton and the Civil War. New York: Free Press, 1994.
it should say Died: April 21, 1912 NOT 1922. She spent 2 years nursing David back to health and she started working at a school in Massachusetts and New Jersy and then wstablished on of the countrys first free public school in Bordentown, New Jersey. When was this article published and who published it? I think that this is an awful article I think you should completely delete this crap.